Objective To determine whether individual fruits are differentially associated with risk of type 2 diabetes. Participants 66 105 women from the Nurses’ Health Study (1984-2008), 85 104 women from the Nurses’ Health Study II (1991-2009), and 36 173 men from the Health Professionals Follow-up Study (1986-2008) who were free of major chronic diseases at baseline in these studies. Main outcome measure Incident cases of type 2 diabetes, identified through self report and confirmed by supplementary questionnaires. Results During 3 464 641 person years of follow-up, 12 198 participants developed type 2 diabetes. After adjustment for personal, lifestyle, and dietary risk factors of diabetes, the pooled hazard ratio of type 2 diabetes for every three servings/week of total whole fruit consumption was 0.98 (95% confidence interval 0.96 to 0.99). With mutual adjustment of individual fruits, the pooled hazard ratios of type 2 diabetes for every three servings/week were 0.74 (0.66 to 0.83) for blueberries, 0.88 (0.83 to 0.93) for grapes and raisins, 0.89 (0.79 to 1.01) for prunes, 0.93 (0.90 to 0.96) for apples and pears, 0.95 (0.91 to 0.98) for bananas, 0.95 (0.91 to 0.99) for grapefruit, 0.97 (0.92 to 1.02) for peaches, plums, and apricots, 0.99 (0.95 to 1.03) for oranges, 1.03 (0.96 to 1.10) for strawberries, and 1.10 (1.02 to 1.18) for cantaloupe. The pooled hazard ratio for the same increment in fruit juice consumption was 1.08 (1.05 to 1.11). The associations with risk of type 2 diabetes differed significantly among individual fruits (P<0.001 in all cohorts). Conclusion Our findings suggest the presence of heterogeneity in the associations between individual fruit consumption and risk of type 2 diabetes. Greater consumption of specific whole fruits, particularly blueberries, grapes, and apples, is significantly associated with a lower risk of type 2 diabetes, whereas greater consumption of fruit juice is associated with a higher risk. We examined the associations of individual fruit consumption in relation to risk of type 2 diabetes using data from three prospective cohort studies in US adults. Moreover, we estimated substitution effects of individual fruits for fruit juice in relation to risk of type 2 diabetes. Secondarily, we examined the associations of fruit groups based on their glycemic index and glycemic load values with risk of type 2 diabetes. We used data from the Nurses’ Health Study (established in 1976; n=121 700), the Nurses’ Health Study II (established in 1989; n=116 671), and the Health Professionals Follow-up Study (established in 1986; n=51 529). These cohort studies are discussed in detail elsewhere.14 15 16 Every two years since baseline, follow-up questionnaires have been mailed to the participants to collect and update information on lifestyle practices and occurrence of chronic diseases. In all three cohorts the follow-up rates are approximately 90%. We excluded participants who reported a diagnosis of diabetes (including types 1 and 2 and gestational diabetes), cardiovascular disease, or cancer at baseline (n=10 134 for the Nurses’ Health Study, 6155 for the Nurses’ Health Study II, and 6707 for the Health Professionals Follow-up Study), those who had missing data for individual fruits and fruit juice or an unusual level of total energy intake (<500 or >3500 kcal/day for the Nurses’ Health Study and the Nurses’ Health Study II and <800 or >4200 kcal/day for the Health Professionals Follow-up Study) (n=4765 for the Nurses’ Health Study, 5647 for the Nurses’ Health Study II, and 5750 for the Health Professionals Follow-up Study), those whose diagnosis date of type 2 diabetes was unclear (n=200 for Health Professionals Follow-up Study), and those who completed only the baseline questionnaire (n=719 for the Nurses’ Health Study, 699 for the Nurses’ Health Study II, and 1103 for the Health Professionals Follow-up Study). After excluding these participants, 66 105 women in the Nurses’ Health Study, 85 104 women in the Nurses’ Health Study II, and 36 173 men in the Health Professionals Follow-up Study were available for the analysis. In 1984 a 118 item food frequency questionnaire was sent to the participants of the Nurses’ Health Study to assess their habitual diet in the past year. In 1986 and every four years thereafter, a similar but expanded questionnaire was sent to the participants to update their dietary information. The expanded questionnaire was also administered every four years to assess diet among the participants in the Health Professionals Follow-up Study since 1986 and those in the Nurses’ Health Study II since 1991. In all food frequency questionnaires we asked the participants how often, on average, they consumed each food in a standard portion size. Participants could choose from nine possible responses, ranging from “never, or less than once per month” to “six or more times per day.” We consistently asked about 10 individual fruits since baseline: grapes or raisins; peaches, plums, or apricots; prunes; bananas; cantaloupe; apples or pears; oranges; grapefruit; strawberries; and blueberries. We calculated total whole fruit consumption by summing the consumption levels of the 10 individual fruits and watermelon, which we inquired about sporadically during follow-up. Fruit juice included apple, orange, grapefruit, and other juices. The food frequency questionnaires were validated against diet records among 173 participants in the Nurses’ Health Study in 1980 and 127 participants in the Health Professionals Follow-up Study in 1986.17 18 19 Corrected correlation coefficients between food frequency questionnaire and diet record assessments of individual fruit consumption were 0.80 for apples, 0.79 for bananas, and 0.74 for oranges in women,17 and 0.67 for total whole fruits, 0.76 for fruit juice, 0.95 for bananas, 0.84 for grapefruit, 0.76 for oranges, 0.70 for apples and pears, 0.59 for raisins and grapes, and 0.38 for strawberries in men.18 19 For some individual fruits, the corrected correlation coefficients were not available owing to large within person variability in the comparison methods. In the follow-up questionnaires administered every two years, we inquired and updated information on anthropometric and lifestyle factors for chronic diseases, including body height and weight, cigarette smoking, physical activity, multivitamin use, and family history of diabetes. Among participants in the Nurses’ Health Study and Nurses’ Health Study II, we ascertained menopausal status, post-menopausal hormone use, and oral contraceptive use (Nurses’ Health Study II only). Estimates of total physical activity levels were calculated by multiplying the energy expenditure in metabolic equivalent tasks (METs) measured in hours per week of each activity by hours spent on the activity and summing the values of all activities. Each MET hour is the caloric need per kilogram of body weight per hour of an activity, divided by the caloric need per kilogram of weight per hour at rest. Based on the food frequency questionnaire, we derived a score of the alternate healthy eating index, an indicator of adherence to healthy eating behavior, described in detail elsewhere.20 In brief, the alternate healthy eating index score summarizes the consumption of 11 foods or nutrients (including consumption of vegetables, fruits, whole grains, sugar sweetened beverages and fruit juice, nuts and legumes, red and processed meat, trans fat, long chain n-3 fat, polyunsaturated fat, sodium, and alcohol). Each component was scored on a scale of 0 to 10. In the current analysis, we excluded fruits and fruit juice when calculating the alternate healthy eating index score. We calculated each participant’s person years from the return date of the baseline food frequency questionnaire to the date of the type 2 diabetes diagnosis, date of death, last return of a valid follow-up questionnaire, or end of follow-up (2008 for the Nurses’ Health Study and Health Professionals Follow-up Study, or 2009 for the Nurses’ Health Study II), whichever came first. To represent long term dietary intake and minimize within person variation, we calculated and used the cumulative average of dietary intake based on valid assessments from baseline to the end of follow-up.26 To minimize the effects of chronic diseases diagnosed during follow-up on subsequent diet, we stopped updating dietary information after self reported diagnosis of hypertension, hypercholesterolemia, gestational diabetes, cardiovascular disease, or cancer, since these chronic diseases may lead to changes of fruit consumption levels in the cohorts.27 To reduce the effect of potential outliers and to pool the results from the three cohorts, we used the same cut-off points to categorize consumption levels in these studies. The highest two consumption levels were combined for prunes, cantaloupe, and blueberries owing to the small number of participants with high consumption levels of these fruits. To minimize missing covariates, we replaced missing data on body mass index and physical activity with the last valid values. For missing data on body mass index and physical activity at baseline, we created a dummy variable when making categories for these two continuous covariates. Similarly, we also used missing indicator variables to include participants with missing categorical variables, including cigarette smoking, oral contraceptive use (Nurses’ Health Study II only), menopausal status, and post-menopausal hormone use. The overall percentages of missing data for body mass index and physical activity were, respectively, 6.8% and 9.5% in the Nurses’ Health Study, 6.7% and 8.5% in the Nurses’ Health Study II, and 12.8% and 14.0% in the Health Professionals Follow-up Study. The overall percentages of missing values during follow-up ranged from 0.6% (for cigarette smoking) to 5.1% (for menopausal status and post-menopausal hormone use) in the Nurses’ Health Study, from 0.3% (for cigarette smoking) to 4.7% (for menopausal status and post-menopausal hormone use) in the Nurses’ Health Study II, and from 0.1% (for physical activity) to 12.2% (for cigarette smoking) in the Health Professionals Follow-up Study. Using Cox proportional hazard regression, we estimated the hazard ratios and 95% confidence intervals of type 2 diabetes for fruit consumption. We tested the proportional hazard assumption by including interaction terms between individual fruit consumption and duration of follow-up, and the assumption was unlikely violated (P>0.05 for all tests). We examined linear trend by modelling the median values for fruit consumption categories as a continuous variable. Using a fixed effects model, we pooled multivariable adjusted hazard ratios from three cohorts, and we used the Cochrane Q statistic and the I2 statistic to examine the heterogeneity of associations among the cohorts. To examine whether the associations with risk of type 2 diabetes were heterogeneous among individual fruits, we fitted two fully adjusted models: one with total fruit consumption and the other with total fruit consumption plus consumption of individual fruits excluding oranges (which had the most similar association as the total fruit consumption) to avoid over-fitting. Then we used the likelihood ratio test to examine whether the model including individual fruits had better fit than that including total fruit consumption only. We also estimated potential effects of substituting specific fruit consumption for fruit juice consumption by examining the median values for consumption categories of individual fruits and fruit juice in the same multivariate model; the hazard ratios and 95% confidence intervals for substitution effects were calculated based on the differences in point estimates, and the variance and covariance for the regression coefficients of specific fruits and fruit juice.28 To examine the robustness of our findings, we also conducted four sensitivity analyses: evaluating the influence of adjustment for major dietary variables including polyunsaturated to saturated fat ratio, and intakes of trans fat, red meat, fish, whole grains, sugar sweetened beverages, coffee, and nuts (all in fifths) instead of the modified alternate healthy eating index score; adjusting for baseline body mass index instead of updated body mass index to estimate the impact of potential over-adjustment; using baseline consumption levels as an exposure instead of cumulative average of intake levels; and stopping updating diet after diagnosis of gestational diabetes, cardiovascular disease, or cancer only when calculating the cumulative averages. We further examined whether the associations of individual fruit consumption with risk of type 2 diabetes depended on the glycemic index/glycemic load values of fruits. We calculated the glycemic load values per serving for individual fruits based on the glycemic index values from the international glycemic index database13 and the amount of carbohydrate in fruits from the USDA nutritional database11 (see supplementary table 1). We categorized individual fruits into three groups based on their glycemic load values per serving: prunes, bananas, grapes, raisins, apples, and pears for high glycemic load fruits (glycemic load 8.1-19.2); cantaloupe, blueberries, and oranges for moderate glycemic load fruits (5.7-8.0); and peaches, plums, apricots, strawberries, and grapefruit for low glycemic load fruits (1.3-5.6). In terms of the categorization of fruits by the glycemic index values, high glycemic index fruits included cantaloupe, bananas, grapes, raisins (glycemic index 60-70); moderate glycemic index fruits included prunes, blueberries, and grapefruit (47-59); and low glycemic index fruits included apples, pears, oranges, peaches, plums, apricots, and strawberries (34-46). Moreover, to estimate the degree to which the observed associations were explained by flavonoid intake, in a secondary analysis we further adjusted for intake of flavonoid subtypes (flavonols, flavones, flavanones, flavan-3-ols, and anthocyanins). The analysis was stratified jointly by age and calendar year and adjusted for body mass index (kg/m2; <23, 23.0-24.9, 25.0-26.9, 27.0-28.9, 29.0-30.9, 31.0-32.9, 33.0-34.9, 35.0-36.9, 37.0-38.9, 39.0-40.9, 41.0-42.9, 43.0-44.9, ≥45.0, or missing), ethnicity (white, African-American, Hispanic, or Asian), physical activity (MET hours/week; <3, 3.0-8.9, 9.0-17.9, 18.0-26.9, ≥27.0, or missing), cigarette smoking (never, former, currently smoke 1-14 cigarettes/day, currently smoke 15-24 cigarettes/day, or currently smoke ≥25 cigarettes/day, or missing), multivitamin use (yes or no), family history of diabetes (yes or no), menopausal status and post-menopausal hormone use (premenopause, post-menopause (never, former, or current hormone use), or missing) (for women), oral contraceptive use (yes, no, or missing) (Nurses’ Health Study II only), total energy intake (kcal/day), fruit juice consumption (fifths), and the modified alternate healthy eating index score (fifths).20 When examining the association for total whole fruit, we included total fruit consumption in the multivariate model without further adjusting for individual fruits. Likewise, when examining the associations for individual fruits or fruit groups based on their glycemic index/glycemic load values, we included consumption levels of all other individual fruits or fruit groups instead of total fruit consumption in the final model. Statistical analyses were performed with SAS 9.2. All P values were two sided, and statistical significance was defined as P<0.05. During 3 464 641 person years of follow-up, 12 198 participants developed type 2 diabetes (Nurses’ Health Study: 6358 cases/1 394 127 person years; Nurses’ Health Study II: 3153 cases/1 416 111 person years; Health Professionals Follow-up Study: 2687 cases/654 403 person years). The rate of loss to follow-up was low and similar between extreme comparison groups of total fruit consumption levels: the average rate of loss to follow-up for each two year follow-up cycle was 0.8% for <4 servings/week and 0.7% for ≥3 servings/day of total fruit consumption in the Nurses’ Health Study. These values were 0.1% and 0.1% in the Nurses’ Health Study II and 1.0% and 1.1% in the Health Professionals Follow-up Study, respectively. In all three cohorts, total whole fruit consumption was positively correlated with age, physical activity, multivitamin use, total energy intake, fruit juice consumption, and the modified alternate health eating index score, and was inversely associated with body mass index and current smoking (table 1⇓). Whole fruit consumption was associated with an increased probability of using post-menopausal hormones in the Nurses’ Health Study and with a reduced probability of using oral contraceptives in the Nurses’ Health Study II. Individual fruits were correlated with each other weakly to moderately; the highest Spearman correlation coefficients were 0.44 between apples and oranges in the Nurses’ Health Study, 0.47 between strawberries and peaches in the Nurses’ Health Study II, and 0.48 between strawberries and blueberries in the Health Professionals Follow-up Study (see supplementary table 2). The Spearman correlation coefficients for total whole fruits in relation to the modified alternate healthy eating index score were 0.22 for the Nurses’ Health Study, 0.29 for the Nurses’ Health Study II, and 0.28 for the Health Professionals Follow-up Study; those for individual fruits ranged from 0.09 (for bananas) to 0.23 (for apples and pears) in the Nurses’ Health Study, from 0.13 (for bananas) to 0.24 (for apples and pears) in the Nurses’ Health Study II, and from 0.09 (for peaches, plums, and apricots) to 0.24 (for apples and pears) in the Health Professionals Follow-up Study. Total whole fruit consumption was weakly associated with a lower risk of type 2 diabetes: the hazard ratio (95% confidence interval) of type 2 diabetes for every three servings/week of whole fruit consumption was 0.98 (0.96 to 0.99) (table 2⇓). 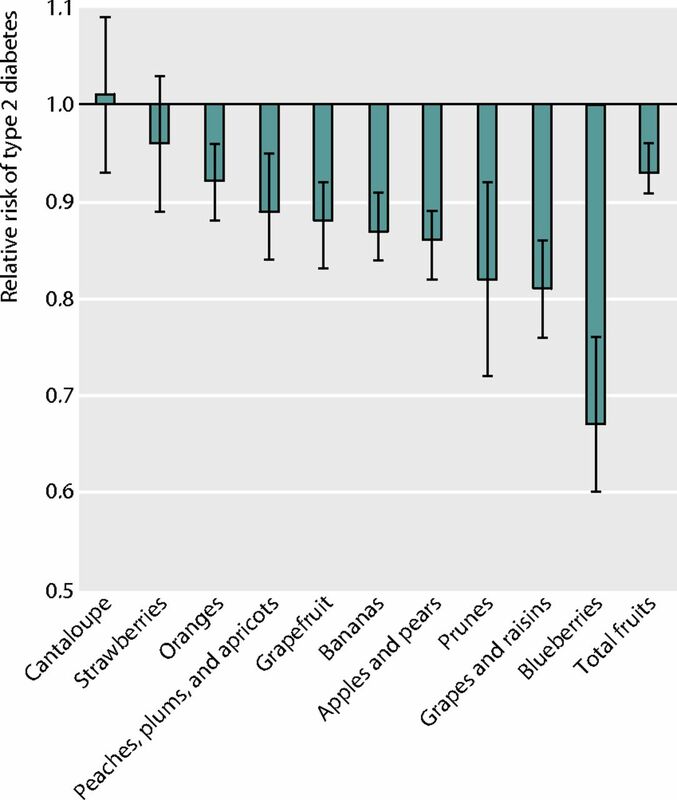 In the age adjusted model, each individual fruit consumption was inversely associated with risk of type 2 diabetes in all cohorts (all P<0.001) (see supplementary table 3). Adjustment for personal factors, lifestyle, fruit juice consumption, and the modified alternate health eating index score attenuated these associations. The inverse association for cantaloupe consumption was no longer statistically significant after multivariable adjustments of the aforementioned covariates. Further adjustment for other individual fruit consumption changed the associations to various degrees (table 3⇓). The inverse associations for grapes and blueberries were attenuated, albeit remaining statistically significant. In contrast, associations for strawberries were attenuated toward the null, and cantaloupe consumption was associated with an increased risk of type 2 diabetes after adjustment for other individual fruits. For every three servings/week, the pooled hazard ratios (95% confidence intervals) of risk for type 2 diabetes was 0.74 (0.66 to 0.83) for blueberries, 0.88 (0.83 to 0.93) for grapes and raisins, 0.93 (0.90 to 0.96) for apples and pears, 0.95 (0.91 to 0.98) for bananas, and 0.95 (0.91 to 0.99) for grapefruit. In contrast, the pooled hazard ratio (95% confidence interval) of risk for type 2 diabetes for the same increment in cantaloupe consumption was 1.10 (1.02 to 1.18). A test for heterogeneity among three cohorts was significant for the associations of bananas and strawberries (P for heterogeneity <0.001 for bananas and 0.01 for strawberries). In the Nurses’ Health Study II and Health Professionals Follow-up Study, banana consumption was associated with a lower risk of type 2 diabetes, whereas in the Nurses’ Health Study a non-significant positive association was found. The association for strawberry consumption was significantly positive in the Health Professionals Follow-up Study but was non-significant and inverse in the Nurses’ Health Study. Further adjustment for intake levels of flavonoid subtypes (flavonols, flavones, flavanones, flavan-3-ols, and anthocyanins) in the final model did not appreciably attenuate the associations for individual fruits (see supplementary table 4). The goodness of fit of model was significantly improved by adding consumption of individual fruits to the model with total whole fruit consumption and other covariates (P<0.001 for likelihood ratio test in each cohort), indicating that heterogeneity in the associations with risk of type 2 diabetes among individual fruits was significant. In the sensitivity analyses, the associations for individual fruits did not change appreciably with adjustment for major dietary factors instead of the modified alternate healthy eating index score, or using baseline consumption levels of individual fruits instead of cumulative average of intake levels (see supplementary table 5). When we adjusted for baseline body mass index instead of updated body mass index or stopped updating diet after diagnosis of gestational diabetes, cardiovascular disease, or cancer when calculating the cumulative average of dietary intake, the inverse associations became weaker, although the associations for blueberries, grapes and raisins, and apples and pears remained statistically significant. In the secondary analysis examining the associations between fruit consumption and risk of type 2 diabetes by glycemic index/glycemic load values of fruits, greater consumption of high glycemic load fruits was associated with a lower risk of type 2 diabetes, but not moderate and low glycemic load fruits (table 4⇓). In contrast, greater consumption of moderate glycemic index fruits, but not high and low glycemic index fruits, was inversely associated with risk of type 2 diabetes. Fruit juice consumption was associated with an increased risk of type 2 diabetes. The associations for low glycemic load fruits were heterogeneous among cohorts (P for heterogeneity =0.04): a significant, inverse association was found in the Nurses’ Health Study, but not in the other two cohorts. Replacing each three servings/week of fruit juice consumption with the same amount of total or individual whole fruits, the risk of type 2 diabetes in the pooled analysis was 7% (95% confidence interval 4% to 9%) lower for total whole fruits, 33% (24% to 40%) lower for blueberries, 19% (14% to 24%) lower for grapes and raisins, 14% (11% to 18%) lower for apples and pears, 13% (9% to 16%) lower for bananas, and 12% (8% to 17%) lower for grapefruit after adjustment for personal factors, lifestyle, and the modified alternate health eating index score (figure⇓). Additionally, we found that replacing fruit juice with oranges, peaches, plums, and apricots was also associated with a lower risk of type 2 diabetes: 18% (8% to 28%) lower for prunes, 11% (5% to 16%) lower for peaches, plums, and apricots, and 8% (4% to 12%) lower for oranges. In three prospective cohorts of US men and women, we found that the associations with risk of type 2 diabetes differed significantly among individual fruits: greater consumption of blueberries, grapes, apples, bananas, and grapefruit were significantly associated with a reduced risk of type 2 diabetes. Most of these associations were quite consistent among three cohorts. Additionally, differences in the glycemic index/glycemic load values of fruits did not account for the association of specific fruits with risk of type 2 diabetes. Moreover, greater fruit juice consumption was associated with an increased risk, and substitution of whole fruits for fruit juice was associated with a lower risk, except for strawberries and cantaloupe. In eight previous prospective studies, the association between total fruit consumption and risk of type 2 diabetes was examined,2 3 4 5 6 7 8 9 and the results were mixed. Similar to previous analyses in the Nurses’ Health Study3 and the Finnish Mobile Clinic Health Examination Survey study,2 the current findings supported an inverse association between total fruit consumption and risk of type 2 diabetes, but not in other studies.4 5 6 7 8 9 In contrast to total fruit consumption, evidence on consumption of individual fruits or fruit groups with risk of type 2 diabetes is limited and incomplete. In four prospective studies, consumption of citrus fruit was not associated with a lower risk of type 2 diabetes.5 6 7 8 Apple consumption was inversely associated with risk in the Women’s Health Study29 and in the Finnish study,30 but not in the Iowa Women’s Health Study.31 In addition, greater consumption of berries was associated with a lower risk in the Finnish study,2 but not in the Iowa Women’s Health Study.31 In our previous analyses that focused on anthocyanin rich fruits, intakes of blueberries, strawberries, and apples were associated with a lower risk of type 2 diabetes.32 Consistently, in a clinical trial, increased consumption of berries improved glycemic control among people with diabetes.33 Our current investigation extended the evidence in this regard and found novel, inverse associations for grapes, bananas, and grapefruit. The glycemic index/glycemic load values of fruits did not seem to be the factor that determined their association with type 2 diabetes in the current study, although in a clinical trial, increased consumption of low glycemic index fruits improved glycemic control among people with diabetes.33 In recent meta-analyses, a higher dietary glycemic index/glycemic load was associated with a greater risk of type 2 diabetes.49 50 In the Nurses’ Health Study and Health Professionals Follow-up Study, the associations between dietary glycemic index and risk of type 2 diabetes were positive, although the associations for dietary glycemic load were not significant.51 52 53 None the less, the contribution of total fruit consumption to dietary glycemic load was rather small (about 10%) in these populations. Of individual fruits, the top three contributors to dietary glycemic load were bananas (3-4%), apples (2%), and grapes (1%). In contrast, the relatively high glycemic load values of fruit juices13 along with reduced levels of beneficial nutrients through juicing processes11 12 (for example, the glycemic load values per serving are 6.2 for raw oranges and 13.4 for orange juice, and fibre levels per serving are 3.1 g and 0.5 g, respectively) may explain the positive associations between fruit juice consumption and risk of type 2 diabetes. Moreover, the difference in the viscosity of foods is also an important factor affecting postprandial blood glucose dynamics. Fluids pass through the stomach to the intestine more rapidly than solids even if nutritional content is similar.54 For example, fruit juices lead to more rapid and larger changes in serum levels of glucose and insulin than whole fruits.55 56 Although these mechanisms may potentially explain the diverse associations for individual fruits, further research is apparently needed to confirm our findings on specific fruits in relation to type 2 diabetes and to further elucidate underlying mechanisms. The present study has several limitations. Firstly, measurement errors were inevitable in the estimates of fruit consumption, especially for individual fruits with lower consumption levels.17 18 Adjustment for energy intake and use of cumulatively averaged intake levels can reduce the magnitude of measurement errors to some extent.26 Generally, random errors in exposure assessments attenuate true associations toward the null. Secondly, the possibility of false positive findings may exist because we examined the associations of multiple fruits in the current investigation without adjusting for multiple comparisons based on a priori hypotheses. Meanwhile, most associations were consistent across three cohorts, and the associations for blueberries, grapes, and apples remained statistically significant even after applying the Bonferroni correction, a conservative method correcting for multiple comparisons. Thirdly, in our food frequency questionnaires, intakes of some individual fruits (apples and pears; peaches, plums, and apricots) were combined because these fruits have similar nutrient profiles. Therefore we could not determine whether the associations for these combined fruits can be ascribed to a specific individual fruit. Fourthly, we cannot exclude the possibility of recall bias in the assessments of diet based on the food frequency questionnaires. However, the prospective study design and exclusion of participants with chronic diseases at baseline should minimize such bias. Fifthly, although in the multivariable analysis we considered a multitude of lifestyle and dietary factors, including other individual fruits, residual or unmeasured confounding may still exist. Finally, our study populations primarily consist of health professionals with European ancestry. Thus our findings may not be generalized to other populations. Our findings suggest that there is significant heterogeneity in the associations between individual fruits and risk of type 2 diabetes. Greater consumption of specific whole fruits, particularly blueberries, grapes, and apples, was significantly associated with a lower risk of type 2 diabetes, whereas greater fruit juice consumption was associated with a higher risk. The differences in the associations between individual fruits were not accounted for by variation in the glycemic index/glycemic load values of individual fruits. Overall, these results support recommendations on increasing consumption of a variety of whole fruits, especially blueberries, grapes, and apples, as a measure for diabetes prevention. Contributors: RMvD, FBH, and WC obtained funding from the National Institutes of Health. IM, RMvD, and QS designed this study. RMvD, QS, JEM, FBH, and WCW were involved in data collection. IM, FI, QS, and RMvD provided statistical expertise. IM analysed the data and wrote the first draft of the manuscript. All authors contributed to the interpretation of the results and critical revision of the manuscript for important intellectual content and approved the final version of the manuscript. IM and QS are the guarantors of this investigation. Funding: This study was funded by research grants CA87969, CA176726, CA55075, CA50385, CA167552, DK58845, and DK082486 from the National Institutes of Health. Dr. Sun was supported by a career development award R00HL098459 from the National Heart, Lung, and Blood Institute. The funding sources had no role in study design; in the collection, analysis, and interpretation of data; in the writing of the report; or in the decision to submit the article for publication. The authors are not affiliated with the funding institutions. Competing interests: All authors have completed the ICMJE uniform disclosure form at www.icmje.org/coi_disclosure.pdf (available on request from the corresponding author) and declare: no support from any organisation for the submitted work; no financial relationships with any organisations that might have an interest in the submitted work in the previous three years, no other relationships or activities that could appear to have influenced the submitted work. Ethical approval: The study protocol was approved by the institutional review boards of the Brigham and Women’s Hospital, and the Harvard School of Public Health. The completion of the self administered questionnaire was considered to imply informed consent. World Health Organization. Promoting fruit and vegetable consumption around the world. 2003. www.who.int/dietphysicalactivity/fruit/en/index.html. Montonen J, Järvinen R, Heliövaara M, Reunanen A, Aromaa A, Knekt P. Food consumption and the incidence of type II diabetes mellitus. Eur J Clin Nutr2005;59:441-8. Bazzano LA, Li TY, Joshipura KJ, Hu FB. Intake of fruit, vegetables, and fruit juices and risk of diabetes in women. Diabetes Care2008;31:1311-7.
Cooper AJ, Sharp SJ, Lentjes MA, Luben RN, Khaw KT, Wareham NJ, et al. A prospective study of the association between quantity and variety of fruit and vegetable intake and incident type 2 diabetes. Diabetes Care2012;35:1293-300.
Cooper AJ, Forouhi NG, Ye Z, Buijsse B, Arriola L, Balkau B, et al. Fruit and vegetable intake and type 2 diabetes: EPIC-InterAct prospective study and meta-analysis. Eur J Clin Nutr2012;66:1082-92. Kurotani K, Nanri A, Goto A, Mizoue T, Noda M, Kato M, et al. Vegetable and fruit intake and risk of type 2 diabetes: Japan Public Health Center-based Prospective Study. Br J Nutr2013 (in press). Villegas R, Shu XO, Gao YT, Yang G, Elasy T, Li H, et al. Vegetable but not fruit consumption reduces the risk of type 2 diabetes in Chinese women. J Nutr2008;138:574-80. Liu S, Serdula M, Janket SJ, Cook NR, Sesso HD, Willett WC, et al. A prospective study of fruit and vegetable intake and the risk of type 2 diabetes in women. Diabetes Care2004;27:2993-6. Meyer KA, Kushi LH, Jacobs DR Jr, Slavin J, Sellers TA, Folsom AR. Carbohydrates, dietary fiber, and incident type 2 diabetes in older women. Am J Clin Nutr2000;71:921-30. Carter P, Gray LJ, Troughton J, Khunti K, Davies MJ. Fruit and vegetable intake and incidence of type 2 diabetes mellitus: systematic review and meta-analysis. BMJ2010;341:c4229. US Department of Agriculture, Agricultural Research Service. USDA national nutrient database for standard reference, release 25. Nutrient Data Laboratory. 2012. www.ars.usda.gov/ba/bhnrc/ndl. US Department of Agriculture, Agricultural Research Service. USDA database for the flavonoid content of selected foods, release 3.1. Nutrient Data Laboratory. 2013. www.ars.usda.gov/Services/docs.htm?docid=6231. University of Sydney. Online glycemic index database. www.glycemicindex.com/. Schulze MB, Manson JE, Willett WC, Hu FB. Processed meat intake and incidence of type 2 diabetes in younger and middle-aged women. Diabetologia2003;46:1465-73. Van Dam RM, Willett WC, Rimm EB, Stampfer MJ, Hu FB. Dietary fat and meat intake in relation to risk of type 2 diabetes in men. Diabetes Care2002;25:417-24. Fung TT, Schulze M, Manson JE, Willett WC, Hu FB. Dietary patterns, meat intake, and the risk of type 2 diabetes in women. Arch Intern Med2004;164:2235-40. Salvini S, Hunter DJ, Sampson L, Stampfer MJ, Colditz GA, Rosner B, et al. Food-based validation of a dietary questionnaire: the effects of week-to-week variation in food consumption. Int J Epidemiol1989;18:858-67. Feskanich D, Rimm EB, Giovannucci EL, Colditz GA, Stampfer MJ, Litin LB, et al. Reproducibility and validity of food intake measurements from a semiquantitative food frequency questionnaire. J Am Diet Assoc1993;93:790-6. Hu FB, Rimm E, Smith-Warner SA, Feskanich D, Stampfer MJ, Ascherio A, et al. Reproducibility and validity of dietary patterns assessed with a food-frequency questionnaire. Am J Clin Nutr1999;69:243-9. Chiuve SE, Fung TT, Rimm EB, Hu FB, McCullough ML, Wang M, et al. Alternative dietary indices both strongly predict risk of chronic disease. J Nutr2012;142:1009-18. National Diabetes Data Group. Classification and diagnosis of diabetes mellitus and other categories of glucose intolerance. Diabetes1979;28:1039-57. Report of the Expert Committee on the Diagnosis and Classification of Diabetes Mellitus. Diabetes care1997;20:1183-97. Manson JE, Rimm EB, Stampfer MJ, Colditz GA, Willett WC, Krolewski AS, et al. Physical activity and incidence of non-insulin-dependent diabetes mellitus in women. Lancet1991;338:774-8. Hu FB, Leitzmann MF, Stampfer MJ, Colditz GA, Willett WC, Rimm EB. Physical activity and television watching in relation to risk for type 2 diabetes mellitus in men. Arch Intern Med2001;161:1542-8. Rich-Edwards JW, Corsano KA, Stampfer MJ. Test of the National Death Index and Equifax Nationwide Death Search. Am J Epidemiol1994;140:1016-9. Hu FB, Stampfer MJ, Rimm E, Ascherio A, Rosner BA, Spiegelman D, et al. Dietary fat and coronary heart disease: a comparison of approaches for adjusting for total energy intake and modeling repeated dietary measurements. Am J Epidemiol1999;149:531-40. Shekelle RB, Stamler J, Paul O, Shryock AM, Liu S, Lepper M. Dietary lipids and serum cholesterol level: change in diet confounds the cross-sectional association. Am J Epidemiol1982;115:506-14. Bernstein AM, Sun Q, Hu FB, Stampfer MJ, Manson JE, Willett WC. Major dietary protein sources and risk of coronary heart disease in women. Circulation2010;122:876-83. Song Y, Manson JE, Buring JE, Sesso HD, Liu S. Associations of dietary flavonoids with risk of type 2 diabetes, and markers of insulin resistance and systemic inflammation in women: a prospective study and cross-sectional analysis. J Am Coll Nutr2005;24:376-84. Knekt P, Kumpulainen J, Järvinen R, Rissanen H, Heliövaara M, Reunanen A, et al. Flavonoid intake and risk of chronic diseases. Am J Clin Nutr2002;76:560-8. Nettleton JA, Harnack LJ, Scrafford CG, Mink PJ, Barraj LM, Jacobs DR Jr. Dietary flavonoids and flavonoid-rich foods are not associated with risk of type 2 diabetes in postmenopausal women. J Nutr2006;136:3039-45. Wedick NM, Pan A, Cassidy A, Rimm EB, Sampson L, Rosner B, et al. Dietary flavonoid intakes and risk of type 2 diabetes in US men and women. Am J Clin Nutr2012;95:925-33. Jenkins DJ, Srichaikul K, Kendall CW, Sievenpiper JL, Abdulnour S, Mirrahimi A, et al. The relation of low glycaemic index fruit consumption to glycaemic control and risk factors for coronary heart disease in type 2 diabetes. Diabetologia2011;54:271-9. Takikawa M, Inoue S, Horio F, Tsuda T. Dietary anthocyanin-rich bilberry extract ameliorates hyperglycemia and insulin sensitivity via activation of AMP-activated protein kinase in diabetic mice. J Nutr2010;140:527-33. Xia EQ, Deng GF, Guo YJ, Li HB. Biological activities of polyphenols from grapes. Int J Mol Sci2010;11:622-46. Baur JA, Pearson KJ, Price NL, Jamieson HA, Lerin C, Kalra A, et al. Resveratrol improves health and survival of mice on a high-calorie diet. Nature2006;444:337-42. Timmers S, Konings E, Bilet L, Houtkooper RH, van de Weijer T, Goossens GH, et al. Calorie restriction-like effects of 30 days of resveratrol supplementation on energy metabolism and metabolic profile in obese humans. Cell Metab2011;14:612-22. Yoshino J, Conte C, Fontana L, Mittendorfer B, Imai S, Schechtman KB, et al. Resveratrol supplementation does not improve metabolic function in nonobese women with normal glucose tolerance. Cell Metab2012;16:658-64. Poulsen MM, Vestergaard PF, Clasen BF, Radko Y, Christensen LP, Stødkilde-Jørgensen H, et al. High-dose resveratrol supplementation in obese men: an investigator-initiated, randomized, placebo-controlled clinical trial of substrate metabolism, insulin sensitivity, and body composition. Diabetes2013;62:1186-95. Nakatani N, Kayano S, Kikuzaki H, Sumino K, Katagiri K, Mitani T. Identification, quantitative determination, and antioxidative activities of chlorogenic acid isomers in prune (Prunus domestica L.). J Agric Food Chem2000;48:5512-6. Rossato SB, Haas C, Raseira Mdo C, Moreira JC, Zuanazzi JA. Antioxidant potential of peels and fleshes of peaches from different cultivars. J Med Food2009;12:1119-26. Dragovic-Uzelac V, Levaj B, Mrkic V, Bursac D, Boras M. The content of polyphenols and carotenoids in three apricot cultivars depending on stage of maturity and geographical region. Food Chem2007;102:966-75. Lotito SB, Frei B. Relevance of apple polyphenols as antioxidants in human plasma: contrasting in vitro and in vivo effects. Free Radic Biol Med2004;36:201-11. Huxley R, Lee CM, Barzi F, Timmermeister L, Czernichow S, Perkovic V, et al. Coffee, decaffeinated coffee, and tea consumption in relation to incident type 2 diabetes mellitus: a systematic review with meta-analysis. Arch Intern Med2009;169:2053-63. Tunnicliffe JM, Eller LK, Reimer RA, Hittel DS, Shearer J. Chlorogenic acid differentially affects postprandial glucose and glucose-dependent insulinotropic polypeptide response in rats. Appl Physiol Nutr Metabol2011;36:650-9. Ong KW, Hsu A, Tan BK. Chlorogenic acid stimulates glucose transport in skeletal muscle via AMPK activation: a contributor to the beneficial effects of coffee on diabetes. PloS One2012;7:e32718. Parmar HS, Jain P, Chauhan DS, Bhinchar MK, Munjal V, Yusuf M, et al. DPP-IV inhibitory potential of naringin: an in silico, in vitro and in vivo study. Diabetes Res Clin Pract2012;97:105-11. Drucker DJ. Dipeptidyl peptidase-4 inhibition and the treatment of type 2 diabetes: preclinical biology and mechanisms of action. Diabetes Care2007;30:1335-43. Dong JY, Zhang L, Zhang YH, Qin LQ. Dietary glycaemic index and glycaemic load in relation to the risk of type 2 diabetes: a meta-analysis of prospective cohort studies. Br J Nutr2011;106:1649-54. Livesey G, Taylor R, Livesey H, Liu S. Is there a dose-response relation of dietary glycemic load to risk of type 2 diabetes? Meta-analysis of prospective cohort studies. Am J Clin Nutr2013;97:584-96. Salmerón J, Ascherio A, Rimm EB, Colditz GA, Spiegelman D, Jenkins DJ, et al. Dietary fiber, glycemic load, and risk of NIDDM in men. Diabetes Care1997;20:545-50. Salmerón J, Manson JE, Stampfer MJ, Colditz GA, Wing AL, Willett WC. Dietary fiber, glycemic load, and risk of non-insulin-dependent diabetes mellitus in women. JAMA1997;277:472-7. Schulze MB, Liu S, Rimm EB, Manson JE, Willett WC, Hu FB. Glycemic index, glycemic load, and dietary fiber intake and incidence of type 2 diabetes in younger and middle-aged women. Am J Clin Nutr2004;80:348-56. Willis HJ, Thomas W, Willis DJ, Slavin JL. Feasibility of measuring gastric emptying time, with a wireless motility device, after subjects consume fiber-matched liquid and solid breakfasts. Appetite2011;57:38-44. Haber GB, Heaton KW, Murphy D, Burroughs LF. Depletion and disruption of dietary fibre. Effects on satiety, plasma-glucose, and serum-insulin. Lancet1977;2:679-82. Bolton RP, Heaton KW, Burroughs LF. The role of dietary fiber in satiety, glucose, and insulin: studies with fruit and fruit juice. Am J Clin Nutr1981;34:211-7.